I'd check those little screws as soon as I got it in. Chinese pot metal reproductions are usually running cheese grade screws that rust almost immediately. I do like the way they look, though it looks like they sit awfully low compared to stock. How far out of the field of view are they? I have just fitted the mirrors as suggested by Planenut. They look very neat and work well on the nearside, but do not have so wide a field of view on the offside. Probably get used to that and at least they don't vibrate. So I fitted a rear view mirror on the Faibourne central pillar. Melvyn Rutter can supply this as a bolt on accessory, but didn't currently have any in stock, so they just sent me the mirror alone. Picture below is the packaging, for those who might want to source it. Dismantling is very simple, all that was needed was a stainless steel column turned up to go through the Fairbourne screen pillar. I opened the bolt hole in the windscreen to 6mm because that was the size of dome head nut I had in stock and this size would cover the countersunk hole better. The mirror works well in service, giving a very comfortable rearward view, but does vibrate a little - but not as bad as the original mirrors. Very neat. Looks like you did a metal dash mod as well. I have just fitted the mirrors as suggested by Planenut. They look very neat and work well on the nearside, but do not have so wide a field of view on the offside. Probably get used to that and at least they don't vibrate. So I fitted a rear view mirror on the Faibourne central pillar. Melvyn Rutter can supply this as a bolt on accessory, but didn't currently have any in stock, so they just sent me the mirror alone. Agree with your findings Tim both good and bad, regarding the Lucas style mirrors, so will also be fitting the central rear view mirror you have sourced to my Fairbourne screen pillar. Spoke to Melvyn Rutter yesterday, they expect to have the mount spindles available to complete the kit in about 10 days. Just received a response to my inquiry as to the availability from Melvyn Rutter, and they have the mirrors in stock, but they are quite costly: "3 wheeler mirror with flat glass for use with Fairbourne windscreen, in stock and cost is £75 plus delivery." Unfortunately didn't have Tim W's skill on a lathe so had to cough up. 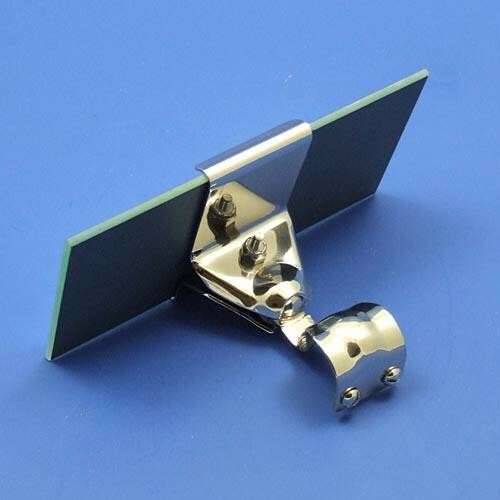 If you were able to make a suitable spindle, the price of the mirror itself is not too bad. Agreed - and it's certainly a limited market, so not too hard to understand. But I'm not too bad on a lathe, so I think I may have a go on my own first before I bite the bullet. ...Might consider a central mirror as I have a Fairbourne screen. I fitted the mirror in the lower photo to my full MMC screen, but despite adding a rubber mounting pad there is too much vibration at speed. It helps a little with reversing. Whilst it looks a neat solution I think I can see why you have vibration issues. The distance from mounting base to mirror is too great. The double pivot linkage may not help and a rubber mounting will just serve to exaggerate any vibration. FWIW the Melvyn Rutter, Fairbourne screen mount one I have works fine given its light weight and short stem.